Antibodies are critical components of the human adaptive immune system, providing versatile scaffolds to display diverse antigen-binding surfaces. Nevertheless, most antibodies have similar architectures, with the variable immunoglobulin domains of the heavy and light chain each providing three hypervariable loops, which are varied to generate diversity. The recent identification of a novel class of antibody in humans from malaria endemic regions of Africa was therefore surprising as one hypervariable loop contains the entire collagen-binding domain of human LAIR1. Here, we present the structure of the Fab fragment of such an antibody. We show that its antigen-binding site has adopted an architecture that positions LAIR1, while itself being occluded. This therefore represents a novel means of antigen recognition, in which the Fab fragment of an antibody acts as an adaptor, linking a human protein insert with antigen-binding potential to the constant antibody regions which mediate immune cell recruitment. When bacteria, viruses or parasites invade the human body, the immune system responds by producing proteins called antibodies. Antibodies recognize and bind to molecules (known as antigens) on the surface of the invaders. This binding can either neutralize the invader directly or trigger signals that cause other parts of the immune system to destroy it. Our blood contains a huge range of different antibody molecules that each bind to a different antigen. This is despite most human antibodies having the same basic shape and structure. Six loops, known as complementarity determining regions (CDRs), emerge from the surface of the antibody to form the surface that recognizes the antigen. However, variations in the structure of the loops alter this surface enough to allow different antibodies to recognize completely different molecules. In 2016, a new class of antibodies was identified. Unlike previously identified antibodies, these molecules had an entire human protein, called LAIR1, inserted into one of their CDR loops. Members of this group of antibodies bind to a molecule, known as a RIFIN, that is found on the surface of human red blood cells that are infected with the parasite that causes malaria. How do LAIR1-containing antibodies bind to their RIFIN targets? Hsieh and Higgins investigated this question by using a technique called X-ray crystallography to determine the structure of the antibody. This revealed that instead of binding directly to an antigen, all of the six CDR loops in the LAIR1-containing antibody bind to the LAIR1 insert. By doing so, LAIR1 is oriented in a manner that enables it to bind to the RIFIN molecule from the parasite. This is the first known example of an antibody that recruits another protein to bind to an antigen rather than binding directly to the pathogen itself. A future challenge will be to see if other antibodies exist that use this mechanism and whether it can be employed to design new therapeutic antibodies. The antigen-binding sites of human antibodies commonly adopt similar structures, with the light and heavy chains each providing three hypervariable loops that combine to form a surface that is complementary to the epitope. While the sequences of these complementarity determining regions (CDRs) are highly variable, five of the six CDRs (L1, L2, L3, H1 and H2) can be classified into a number of relatively small sets, with similar lengths and architectures, and their structures are predictable from sequence (Chothia et al., 1989; North et al., 2011). In contrast, the third CDR loop of the heavy chain (CDR H3) is more structurally diverse, most likely due to its location close to the V(D)J recombination site (Weitzner et al., 2015). Human antibodies typically have CDR H3 lengths of 8–16 residues (Zemlin et al., 2008) while mouse antibodies have CDR H3 lengths of 5–26 residues (Zemlin et al., 2003). However, recent years have seen the discovery of antibodies with major differences from the norm, in particular due to changes in the length of the third CDR of the heavy chain. A set of antibodies with broadly neutralizing potential against HIV is one such example. Here, the third CDR loop of the heavy chain is elongated, allowing it to reach through the glycan shield that surrounds the gp120 protein to bind an otherwise concealed epitope (McLellan et al., 2011; Pancera et al., 2013; Pejchal et al., 2010). Such antibodies are rare, making the induction of a broadly inhibitory response against HIV a major challenge (Corti and Lanzavecchia, 2013). In a more extreme example, while the majority of bovine antibodies have CDR H3 loops of around 23 residues, around 10% contain a highly elongated third CDR loop of up to 69 residues, containing a small disulphide rich domain (Saini et al., 1999; Wang et al., 2013). These domains adopt a conserved β-sheet structure that displays variable loops and are each presented on an elongated, but rigid β-hairpin (Stanfield et al., 2016; Wang et al., 2013). While it is clear that the additional domains play an important role in ligand binding, the remaining five CDR loops are also exposed and further studies are needed to see the contribution that they make (Wang et al., 2013). A recent study identified a group of even more unusual human antibodies in malaria endemic regions of Africa (Tan et al., 2016). These antibodies were discovered through their capacity to agglutinate human erythrocytes infected with different strains of Plasmodium falciparum, and they bind to a subset of RIFIN proteins. These RIFINs are displayed by the parasite on infected erythrocyte surfaces and are of uncertain function (Chan et al., 2014; Gardner et al., 1998; Kyes et al., 1999). The antibodies show a remarkable adaptation with an intact 96 residue protein, LAIR1, inserted into the third CDR loop of the antibody heavy chain. Indeed, LAIR1 was shown to be essential for the antibody to interact with RIFINs (Tan et al., 2016). In this study, we reveal the structure of the Fab fragment of one of these antibodies, showing how LAIR1 is presented on the antibody surface and drawing conclusions about how this class of antibody can recognize its ligand. We expressed the two chains that make up the Fab fragment of antibody MGD21 (Tan et al., 2016) in a secreted form from HEK293 cells. This antibody has a kappa light chain (VK1-8/JK5) and a heavy chain in which LAIR1 has been inserted into CDR H3. This fragment was purified and crystallised, allowing a dataset to be collected to 2.52 Å resolution. The structure was determined by molecular replacement using LAIR1 (Brondijk et al., 2010) and the Fab fragment of antibody OX117 (Nettleship et al., 2008) as search models. This identified two copies of the MGD21 Fab fragment in the asymmetric unit of the crystal. A model was built for residues 2–211 of the light chain and 1–351 (with 214–219 and 264–270 disordered) of the heavy chain (Figure 1, Figure 1—figure supplement 1, Figure 1—figure supplement 2, Table 1). The two Fab fragments adopt the same structure with a root mean square deviation of 0.26 Å (calculated over 475 Cα atoms) suggesting a highly ordered linkage between the variable domains of the antibody and the LAIR1 insert (Figure 1—figure supplement 3). The antibody sequence has three putative N-linked glycosylation sites, but of these (light chain N30; heavy chain N61 and N242) only N242 shows electron density corresponding to an Asn-linked N-acetyl glucosamine, in a position distant from the LAIR1 insert. Structure of a LAIR1-containing antibody Fab fragment. (A) The structure of the Fab fragment. LAIR1 (red) is inserted into the third CDR loop of the heavy chain (yellow) through two extended linkers (orange). The light chain is blue. The dashed orange link represents protein disordered in the structure. (B) The organization of the CDRs. The three CDR loops of the light chain and remaining two CDR loops of the heavy chain directly contact the LAIR1 insert or the linkers. Each of the CDR loops and its corresponding label is a shown in a different colour. (C) A disulphide bond between C93 of the light chain and C223 of the heavy chain stabilizes the interface (cysteine residues are shown as sticks). Data collection and refinement statistics. The structure was determined from a single crystal. Values in parentheses are for highest-resolution shell. Rfree was determined using 1968 reflections (4.8%) The structure is deposited with pdb code 5NST. 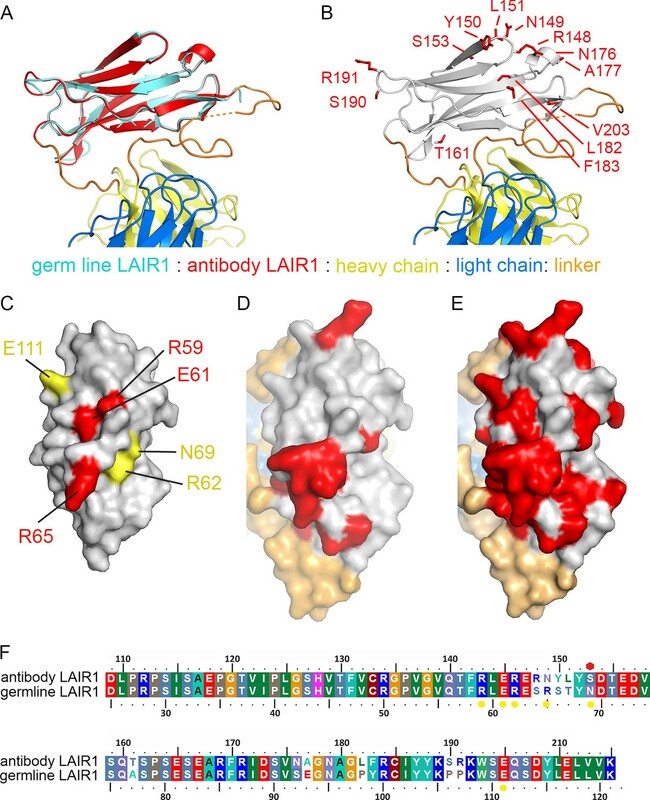 The structure shows LAIR1 emerging from the CDR3 loop of the heavy chain and lying across the antigen-binding surface of the variable domains of the Fab fragment (Figure 1A). The long axis of the LAIR1 insert is positioned with the β-strands aligned approximately perpendicular to the groove between the heavy and light chain CDRs and the insertion and linkers interact with, and occlude all five of the remaining CDR loops. 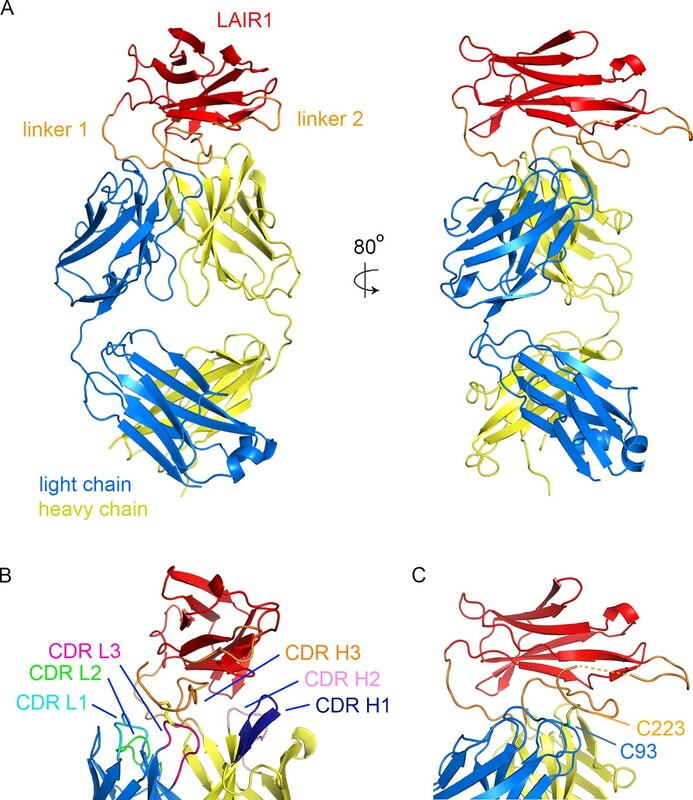 The N- and C-termini of LAIR1 lie at opposite ends of its structure, necessitating long linkers between the sites from which CDR3 emerges from the antibody heavy chain and each terminus of the LAIR1 insert (Figure 1A). The N-terminal linker (linker 1) is 10 residues long and adopts a simple loop structure that joins the antibody variable domain to the N-terminus of the LAIR1 insert. The C-terminal linker (linker 2) is longer at 34 residues and is more complex in structure. It extends out from the C-terminus of the LAIR1 insert before zigzagging back towards the insertion site in the heavy chain variable domain. It is stabilized by hydrogen bonds to the LAIR1 insert and to the antibody heavy chain as well as by a disulphide bond to C93 of the antibody light chain. The linkers of the LAIR1-containing antibodies sequenced to date are variable both in length and content, involving different parts of the intronic regions of the LAIR1 gene, or intergenic sequences of chromosome 13 (Tan et al., 2016). The arrangement of these linkers, which radiate away from the remainder of the antibody, will in theory accommodate almost limitless variation in both length and sequence without disturbing the packing of LAIR1 against the variable domains of the antibody. The five CDR loops lacking the LAIR1 insertion are representatives of previously identified canonical classes (Figure 1—figure supplement 2) (Martin and Thornton, 1996). However, a search using the Abcheck server (Martin, 1996) identified seven unusual residues within the antibody structure; C91, C93, D97 and I106 from the light chain and Y28, R34 and Q54 from the heavy chain, all within the CDR loops. In particular, C91, C93 and D97 all lie in CDR3 of the light chain, perhaps facilitating its interaction with linker 2. Indeed, the most unusual residue is C93, which is found in only 0.096% of light chains, and is the residue that forms a disulphide bond with linker 2 (Figure 1B). The heavy chain CDR H3 loop has a base that adopts the ‘kinked’ conformation (Shirai et al., 1999), with the loop rapidly spreading to the two termini of LAIR1. In previous structures of antibodies with extended heavy chain CDR3 loops, the remaining five CDRs of the antibody are exposed, with the potential to engage in antigen binding (McLellan et al., 2011; Stanfield et al., 2016, Wang et al., 2013). One of the remarkable features of the LAIR1-containing antibody is therefore the occlusion of large parts of each of the remaining five CDRs, with these loops each interacting directly with the LAIR1 insert and/or linkers (Figure 1B, Table 2). The degree of occlusion of the CDRs by LAIR1 was determined by accessibility to a 1.4 Å probe in the presence and absence of LAIR1 and the linkers. Each of these five CDR loops was partly occluded by the presence of LAIR1 or the linkers (occluding 12.7% of the accessible surface area of CDR L1, 18.3% of CDR L2, 47.3% of CDR L3, 34.7% of CDR H1 and 16.0% of CDR H2). Indeed, both the first and second CDRs of the heavy chain directly contact the LAIR1 insert (Table 2). In addition, each of the three CDR loops of the light chain interacts with one of the two linkers, with interactions including a disulphide bond between C93 of the light chain and C223 of linker 2 (Figure 1C, Table 2). These interactions are replicated in both copies of the molecule in the asymmetric unit of the crystal. A list of interactions between the LAIR1 insert and linkers that occupies the heavy chain CDR3 loop and the other five CDR loops of the antibody. The structure of MGD21 argues for a rigid association of the LAIR1 insert with the remainder of the antibody. Firstly, the structures of the two molecules of the antibody in the asymmetric unit of the crystal superimpose closely (Figure 1—figure supplement 2). It is unlikely that this is due solely to constraints from crystal packing as LAIR1 is anchored to the variable domains of the antibody through three fixed positions: the attachment sites of the two linkers, and the disulphide bond between light chain C93 and heavy chain C223 (Figure 1C). In addition, each of the five CDR loops not baring a LAIR1 insertion makes direct interactions with either LAIR1 or the linker, through contacts found in both copies of the antibody in the asymmetric unit of the crystal. This will stabilize a tight association between LAIR1 and the antibody variable domains. As these antibodies can include multiple different light chains, and very different linkers (Tan et al., 2016), these interaction will not be replicated precisely across the antibody family, but some variant of interaction between light chain CDRs and the linkers is likely. A comparison of the LAIR1 insert with that of the chromosomal copy of LAIR1 (referred to below as germ line) (Brondijk et al., 2010) reveals that no global structural changes have taken place (root mean square deviation 0.43 Å for the 82 Cα residues) (Figure 2A,F). Indeed, the LAIR1 insertion in the MDG21 antibody differs in only 13 positions relative to the germ line sequence. Mapping these sites onto the structure reveals that they do not alter residues through which the LAIR1 insert interacts with the rest of the antibody (Figure 2B). Presumably, the stable interaction between LAIR1 and the antibody has therefore come instead from adaptations to the CDR loops. In contrast, polymorphisms are mostly located on the surface of LAIR1 distal to the rest of the antibody and have the potential to alter its interaction with its original ligand, collagen, and with the RIFIN proteins which are the target of these antibodies. Structure and polymorphism in the LAIR1 insertion. (A) An alignment of germ line LAIR1 (cyan) with the antibody LAIR1 insertion (red). (B) The residues that differ between the LAIR1 insertion in antibody MGD21 and germ line LAIR1 are shown as red sticks. (C) A surface representation of the structure of LAIR1 (grey) with residues whose mutation has a major (red) or minor (yellow) effect on collagen binding highlighted (Brondijk et al., 2010). (D) A surface view of the LAIR1 insert in antibody MGD21 (grey) with residues that differ from germ line LAIR1 highlighted (red). (E) A surface view of the LAIR1 insert (grey) with residues that differ from germ line LAIR1 in all 27 antibodies tested to date (Tan et al., 2016) highlighted (red). (F) A sequence alignment of germ line LAIR1 and the LAIR1 insert in the MGD21 antibody. Yellow circles are sites residues shown to play a role in collagen binding while a red hexagon represents a potential N-linked glycosylation site mutated in the LAIR1 insert. The normal function of LAIR1 is to interact with collagen (Meyaard, 2008). The structure of germ line LAIR1, together with NMR analysis and mutagenesis, allowed the mapping of residues critical for the collagen interaction onto a LAIR1 crystal structure (Brondijk et al., 2010). In particular, mutations in residues R59, E61 and R65 have a significant impact on collagen binding (Brondijk et al., 2010). These residues map onto the surface of LAIR1 (Figure 2C) that is most exposed in the context of the antibody (Figure 2D). Indeed, mapping of the polymorphisms found in the 27 LAIR1-containing antibodies sequenced to date shows that large parts of this surface are mutable (Figure 2E). The polymorphisms in LAIR1 include R149N, which is in the position equivalent to R65 in germ line LAIR1 and this change may impact collagen binding. A second polymorphism, found in 7/27 of the antibodies (including MGD21) alters the N-linked glycosyation site at residue 69 of LAIR1 (Wollscheid et al., 2009), which may alter collagen binding and/or increase RIFIN binding, but is not conserved across the antibody family. Indeed 11 of the 27 sequenced antibodies have mutations in at least one of the residues implicated in collagen binding, or other polymorphisms that reduce the interaction (Tan et al., 2016). The LAIR1-containing antibodies are a remarkable variant of the standard immunoglobulin fold. While the majority of mammalian antibodies have predicable and short CDRs, the third CDR of the heavy chain can accommodate usual diversity (Figure 3) (McLellan et al., 2011; Wang et al., 2013; Weitzner et al., 2015). This is seen in the elongated CDR3 of the broadly neutralizing antibodies that interact with HIV surface proteins and in the insertion of a β-hairpin and disulphide-rich domain in a fraction of bovine antibodies. However, in both of these cases, only the heavy chain CDR3 is altered and the remaining CDR loops remain exposed for antigen binding. The LAIR1-containing antibodies are an exception to this, with the LAIR1-insert interacting with, and partly occluding, all five of the remaining CDR loops. In many ways, the structure resembles an antibody with CDR loops adapted for LAIR1 binding, into which LAIR1 has also been inserted. Comparison of the LAIR1-containing antibody with other unusual antibodies. The structure of the LAIR1-containing monoclonal antibody is compared with a classical mouse monoclonal antibody (9AD4; PDB code 4U0R), a human monoclonal antibody with broadly neutralizing potential against HIV (PG16; PDB code 4DQ0) and a bovine monoclonal antibody (BLV5B8; PDB code 4K3E). In each case, the light chain is blue and the two immunoglobulin domains of the heavy chain are yellow. Inserted domains are shown in red with linker regions in orange. This occlusion of large parts of the CDR loops by the LAIR1 insert has major consequences for its role in antigen recognition, as the majority of the antigen-binding surface will be contributed by LAIR1. Indeed, it has been shown that the LAIR1 insert alone can bind to infected erythrocytes, as can a LAIR1-containing antibody with the heavy and light chain regions exchanged (Tan et al., 2016). Surprisingly an antibody in which the LAIR1 insert has been exchanged for the unaltered germ line LAIR1 did not bind to erythrocytes, although the folding of this chimera was not tested (Tan et al., 2016). In addition, the capacity of RIFINs to bind to unaltered LAIR1 alone has not yet been reported. Indeed, it seems most likely that LAIR1, or a highly related homologue, is the physiological ligand of the group of RIFINs that are recognized by these antibodies and that its insertion into the Fab fragment of an antibody allows it to be affinity matured to mobilise it for immune recognition and recruitment of immune cells. This remarkable LAIR1-containing antibody therefore uses the classical hypervariable loops for a novel function: to position an inserted auxillary domain for antigen recognition. The classical Fab fragment therefore now acts as a link between a ligand for a pathogen surface receptor and the Fc region of the antibody with its immune recruitment capability. It will be fascinating to see if this is a paradigm that is repeated in other novel antibodies, as yet undiscovered. Two synthetic complementary DNA clones based on MGD21 (Tan et al., 2016) were obtained from GeneArt (ThermoFisher, UK). The heavy chain variable region was amplified using primers VH-F: 5’-GATGGGTTGCGTAGCTGAAGTGCAGCTGGTGGAAACAGGC-3’ and VH-R: 5’-GGGTGTCGTTTTGGCGCTAGACACTGTCACGGTGGTGCC-3’. The light chain variable region was amplified using primers VL-F: 5’-GATGGGTTGCGTAGCTGCCATCAGAATGACCCAGAGCCCC-3’ and VL-R: 5’-GTGCAGCATCAGCCCGCTTGATTTCCAGCCGGGTGCCC-3’. The resulting PCR products were cloned into pOPINVH (heavy chain variable region) and pOPINVL (light chain variable region) by In-Fusion cloning (Clontech, Mountain View, CA) (Nettleship et al., 2008). Therefore the variable domains from MGD21 were fused to the constant domains derived from the pOPINVH and pOPINVL vectors. DNA constructs expressing heavy and light chains were mixed into a 1 to 1 ratio and co-transfected in HEK293T cells (ThermoFisher Scientific, UK) with polyethyleneimine in the presence of 5 μM kifunensine (Aricescu et al., 2006). After five days, conditioned media was dialysed against phosphate-buffered saline and purified by immobilised metal ion affinity chromatography using TALON resin (Clontech, Mountain View, CA). The Fab heterodimer was further purified by size-exclusion chromatography using a Superdex 200 16/600 column (GE Healthcare Life Sciences) in 10 mM HEPES, pH 7.5 and 150 mM NaCl. Concentrated protein (10 mg/ml) was incubated with Flavobacterium meningosepticum endoglycosidase-F1 for in situ deglycosylation (Hsieh et al., 2016). The protein samples were then subjected to sitting drop vapour diffusion crystallisation trials in SwisSci 96-well plates by mixing 100 nl protein with 100 nl reservoir solution. The protein crystals were obtained in 20% (w/v) PEG4000, 0.1 M sodium citrate, pH 4.5 at 18°C. Crystals were transferred into mother liquor containing 25% (w/v) glycerol and were then cryo-cooled in liquid nitrogen for storage and data collection. Data were collected on beamline I04-1 at the Diamond Light Source and were indexed and scaled using XDS (Kabsch, 2010). Phaser (McCoy et al., 2007) was used to determine a molecular replacement model, using the known structures of LAIR1 (pdb: 3KGR (Brondijk et al., 2010)) and a human monoclonal antibody Fab fragment similar to MGD21 (pdb: 3DIF, (Nettleship et al., 2008)) separated into two files containing the variable and the constant regions, as search models. This identified two copies of the LAIR1-containing Fab fragment in the asymmetric unit of the antibody. Refinement and rebuilding was completed using Buster (Blanc et al., 2004) and Coot (Emsley et al., 2010) respectively. To determine the effect of the LAIR1 insert on the accessible surface area of the CDR loops, we used AREAIMOL from the CCP4 suite (Winn et al., 2011) to determine the accessible surface area of each CDR loop both in the presence and absence of LAIR1 and the linkers. Acta Crystallographica Section D Biological Crystallography 62:1243–1250. Acta Crystallographica Section D Biological Crystallography 60:2210–2221. Cellular and Molecular Life Sciences 71:3633–3657. Annual Review of Immunology 31:705–742. Proteins: Structure, Function, and Genetics 25:130–133. Journal of Molecular Biology 263:800–815. Journal of Leukocyte Biology 83:799–803. Protein Expression and Purification 62:83–89. Journal of Molecular Biology 406:228–256. Nature Structural & Molecular Biology 20:804–813. European Journal of Immunology 29:2420–2426. Journal of Molecular Biology 334:733–749. The Journal of Immunology 181:8416–8424. Thank you for submitting your article "The structure of a LAIR1-containing human antibody reveals a novel mechanism of antigen recognition" for consideration by eLife. Your article has been favorably evaluated by Michel Nussenzweig (Senior Editor) and three reviewers, one of whom is a member of our Board of Reviewing Editors. The following individual involved in review of your submission has agreed to reveal her identity: Robyn Stanfield (Reviewer #2). 1) The most interesting part of the new structure is that the inserted LAIR1 domain occludes the antibody's combining site, which is relevant if the LAIR1 domain is rigidly anchored in such a way to truly preclude access to the CDRs. However, the manuscript makes the point that the CDR H3 linkers are long and flexible, so perhaps the occlusion of the combining is not obligate, but represents the arrangement of the LAIR1 domain in this crystal packing. This should be addressed by an analysis of the different crystal packing environments for the two Fabs in the asymmetric unit of the crystals and a discussion of whether the LAIR1 addition shows the same interactions with the Fab in both copies. A deeper discussion of whether the LAIR1 domain is rigidly docked to the Fab or not, including consideration of crystal contacts limiting domain movement, should be added to a revised manuscript. 2) Related to point 1, the authors can also address whether the LAIR1 domain is rigidly docked to the Fab by discussing whether there are any unusual residues in the Fab framework regions that might be important for interactions with the LAIR domain. Andrew Martin has a website that will identify unusual amino acids in Fabs. 3) Also related to point 1, the authors should show surface areas accessible to a 1.4 Å probe on the CDRs for the structures shown in Figure 3. This would be a nice way to demonstrate that the CDRs are inaccessible in the LAIR1 mAb but not in the other Fab structures. Also, what is the buried surface area between Fab and LAIR1 insert? It would be informative to show these numbers as a function of CDRs (i.e., how much surface is buried at each CDR, and how much at the framework, and on the other side how much of LAIR 1/insert are buried). It was hard to tell from figures and text if the LAIR1 domain is really binding to the CDRs or is just suspended over them? Please explain in more detail. 4) Do the CDR L1, L2, L3, H1 and H2 structures belong to the expected canonical classes? 5) Is the light chain a lambda or kappa chain? 6) Is the H3 base conformation kinked or extended or something else? The Asn at H242 that may be glycosylated can play a role in the conformation of the H3 base, so might see if potential glycosylation there has altered the expected structure. 7) Do you see any residual Nag density? Fabs can by glycosylated, but I don't recall ever seeing a Fab with 3 N-linked glycosylation sites, so could you comment on whether the full-length glycans would likely interact with the LAIR1, or with the RIFIN antigen? And would the germline LAIR1 glycan (at H153) have clashed with the Fab, or would it have been pointing outward toward antigen? 8) In Figure 1—figure supplement 1, it would be helpful to show under the sequences the alignment of the putative V, D, and J genes- to show for example in the H3 region which residues in the linker were likely derived from LAIR1 gene, and which residues derived from antibody gene segments. Also, in addition to the sequential numbers, please show the Kabat numbering for light chain and for the heavy chain (except for the LAIR1 insert which will be impossible to number by the Kabat system). 9) Refinement: The Rfree is a bit high and the Ramachandran statistics are not great for a 2.5 Å structure. Additional refinement cycles and/or rebuilding should be done. Also, Table 1 is too brief. Please include the PDB code, # of observations/unique reflections collected, Rmerge, Rmeas, mean I/σ, # of reflections in the Rfree test set, the B values (Wilson B, and overall B's for solvent, variable, constant, and LAIR1 domains), and the all-atom clashscore. Please also include at least one figure in the supplemental material showing some electron density. Figure 1A,B. CDRs should be highlighted in colors so they can be distinguished. Linkers to LAIR1 should also be highlighted. Figure 1C. Disulfide bond should be highlighted with the cysteines as sticks. Figure 2A legend. Proper terminology is "potential N-linked glycosylation site" rather than "putative glycosylation site." Position of the Asn (serine in antibody LAIR1) should be highlighted on the structure. Figure 2B. Residues shown as sticks should be labeled on the figure. Figure 3. CDRs should be highlighted on all structures. The reviewers start by asking if the arrangement of LAIR1 relative to the rest of the Fab fragment is obligate. Our structure suggests that it is, and we have included a deeper discussion of the evidence in the manuscript. Firstly, when we align the two copies of the antibody structure, they agree extremely well, with an RMSD of 0.26Å, as reported in the Results section. We now include a figure (Figure 1—figure supplement 3) to show this alignment. This shared structure is very unlikely to be due to crystal packing due to the interactions that LAIR1 and the linker make with the remaining CDR loops. In addition, the presence of a disulphide bond between light chain C93 and heavy chain C223 is seen in both copies in the asymmetric unit (labelled in Figure 1). This provides a third anchor point between LAIR1 and the rest of the antibody (together with the junctions with the linkers) and will stabilise their relative organisation. Finally, the interactions between each of the antibody CDRs and the LAIR1 insert and linker (as outlined in Table 2) are replicated in both copies of the asymmetric unit. This evidence all points to a rigid association between the antibody and the LAIR1 insertion. We have collected this argument together into a single place in the Results section to make it clearer. Use of Andrew Martin’s server identified seven amino acids which are usual in this antibody. Four of these occupy the third CDR of the light chain. The most unusual of the residues is light chain C93, which we had previously discussed as forming a disulphide bond with the LAIR1 insert, and is only found in 0.096% of antibody chains. We have added three sentences to the Results section to describe this analysis and have cited the paper related to this server in the paper. As suggested, we determined the percentage of each of the CDR loops that is occluded by LAIR1 and the linkers. To achieve this, we used AREAIMOL from the CCP4 suite to calculate the accessible surface area of each CDR loop to a 1.4Å sphere, both in the intact antibody and an antibody in which we removed CDR H3. This confirmed that each of the five remaining CDR loops was partly occluded by the presence of LAIR1. We have provided this information in the Results section, together with the percentage occlusion, and have also described the procedure used in the Materials and methods. The five CDR loops which do not bare the extension are all members of the canonical classes of CDRs (CDR L1 class 2/11AA; CDR L2 class 1/7AA; CDR L3 class 1/9AA; CDR H1 class 2/11AA; CDR H2 class 1/16AA). We have provided this information in Figure 1—figure supplement 1, in the boxes that indicate the locations of the CDR loops. The light chain of MGD21 is kappa (VK1-8/JK5). We have provided this information in the first paragraph of the Results section. We have confirmed that the base of the H3 loop is of the kinked conformation, as defined by the rules of Shirai et al. We have mentioned this in the text. The reviewers ask about the glycosylation state of the antibody chains. Two of the putative N-linked glycosylation sites (light chain N30 and heavy chain N61) show no evidence of glycosylation in the electron density, while a single GlcNAc is observed on N242 of the heavy chain in each of the copies in the asymmetric unit. We have added a sentence to the first paragraph of the Results section to provide this information and have now shown the sugars in stick representation on the structure in Figure 1A. The reviewers also ask about the location of residue 153 of the heavy chain as the equivalent site in germ line LAIR1 is modified by N-linked glycosylation (residue N69) and this Asn has been mutated to Ser in the form of LAIR1 inserted into the antibody. This residue points away from the rest of the Fab and had already been highlighted in Figure 2C as a residue whose mutation has a minor effect on collagen binding by LAIR1. It is possible that this glycosyation site has been lost to increase RIFIN binding, but in ~75% of the LAIR-1 containing antibody sequences reported to date the glycosylation site is intact. We have now discussed this in the last paragraph of the Results section. We have updated Figure 1—figure supplement 1 to label the regions of the heavy chain that derive from the V and J genes, and from the LAIR1 intron. We have also labelled the sequences of both light and heavy chains with Kabat numbers. We have completed the refinement of the structure with significant improvements in the Ramachandran statistics. We have deposited it in the PDB with code 5NST and a final validation report is included in this submission. We have also updated Table 1 to include the additional statistics requested by the reviewers. For note, we chose to use the CC1/2>0.5 cut off for data processing after observing increased detail in the electron density maps by including the extra data. We have also included a new figure (Figure 1—figure supplement 2) to show electron density for the whole antibody as well as two important regions of the molecule where CDR loops contact and stabilise the LAIR1 insertion. We have made various changes to the figures to improve their clarity and to provide the information requested by the reviewers. We prefer to keep Figure 1A unchanged for clarity but have ensured the linkers are highlighted in orange and are labelled. We have redrawn Figure 1B. The disulphide bond is shown with the cysteine residues as sticks (as it is in Figure 1C) and we have given each of the CDR loops a different colour, which matches the colour of their label. We have labelled each of the residues shown as sticks in Figure 2B and have altered the legend with regard to the description of the glycosylation site. We prefer to keep Figure 3 unchanged, rather than labelling the individual CDRs, as this keeps the figure ‘cleaner’ and focuses the attention of the reader more onto the key region of the CDR H3 loop that we are aiming to highlight here. We thank Dr. Ray Owens at the Oxford Protein Production Facility for the provision of vectors pOPINVH and pOPINVL and the beamline scientists at Diamond Light Source for assistance with data collection. © 2017, Hsieh et al.